I don't drive anymore, so when the Automated Enforcement System (AES) was introduced, I couldn't understand why there was such vehement protest from car owners and drivers. After all, it would discourage speeding and help reduce the high mortality rate on the roads. That was before a friend sent me a video last week that revealed the real story behind the AES controversy. If you have yet to view this interview with William Leong Jee Keen (MP For Selayang), I think you should, especially if you own a car. Note the numbers he quotes. Unbelievable, but Malaysians have come to view revelations like these as no longer surprising. 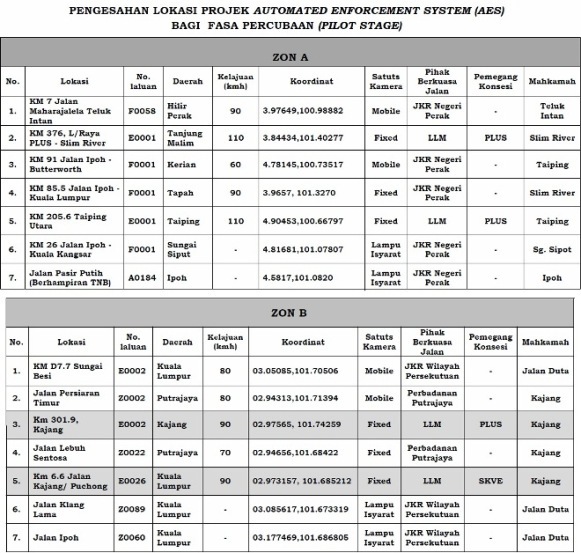 Penang has delayed the implementation of the AES while Selangor has suspended it until further notice. MP for Rembau and UMNO Youth Chief Khairy Jamaluddin has called on the government to defer implementing the AES until all the inherent weaknesses of the system are rectified. to over RM7m and climbing steadily even as I write. There are conflicting reports on the number of summonses issued, and the total amount collected. So take your pick from the Road Transport Department (RTD), the mainstream media, or the alternative online media. To date, a total camera of 831 cameras have been installed - 566 units at speed traps and 265 units at traffic lights. Of these units, 14 have been in operation since September. The AES has been implemented in over 90 countries in the world, including the UK, France and Germany. While few would argue against the effectiveness of the AES in reducing road accidents, many would question where the money is going to and who stands to profit from the large sums collected in fines. 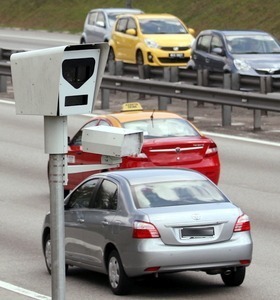 According to Malaysian Insider, "The two firms awarded the contract to implement the enforcement system — ATES Sdn Bhd and Beta Tegap — will spend between RM300 million and RM400 million each to set up traffic cameras at 831 “black spots” nationwide. Both ATES and Beta Tegap are entitled to RM16 per valid summons for the first five million issued. They will then split the remaining revenue evenly with the government up to a cap of RM270 million each. The firms will each receive 7.5 per cent from the remaining revenue and the government will keep the rest." Sounds like profit-making is at the core of the AES system, rather than the much-touted goal of reducing the number of road fatalities. For a list of AES locations, click on the link below. Who would bother doing honest, wealth-generating work when they see such parasites siphoning off obscene amounts of money for doing absolutely nothing productive whatsoever? Only an antiquated feudal mentality would tolerate such an unjust system where you have a few guys like Syed Mokhtar Al-Bukhary and Anandakrishna being handed multi-billion-ringgit monopolies while some folks work 12-hour days and only get paid every month what these leeches earn in 10 minutes!